Outside of the company’s statement, there has been no outside or independent verification of the size of the spill or details about the scale of the possible damage. 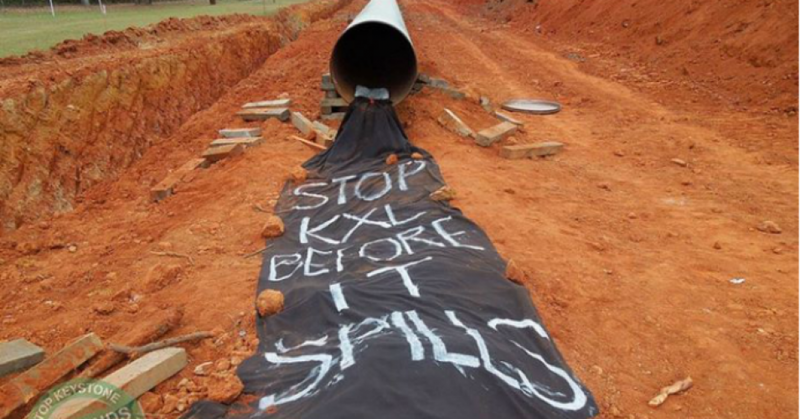 Those who had warned against the pipeline’s approval for precisely these reasons and continue to work tirelessly to prevent the construction of the Keystone XL (KXL) project, were among the first to respond to Thursday’s spill. David Flute, chairman of the Sisseton-Wahpeton Oyate tribe, [said] the leak was on a section of pipeline adjacent to his reservation. He said the area has “the cleanest lakes in South Dakota,” as well as a large subterranean aquifer, and that he was “concerned” about the possibility of contamination. Walsh said the spill had not impacted any bodies of water on the surface, meaning oil “won’t be traveling along a river or a creek.” He also said the oil was unlikely to reach the aquifer in the area, which sit between 800 and 900 feet underground. Butler from Greenpeace, however, said the spill is just the latest evidence showing how fossil fuels represent an antiquated and dangerous mode of energy production. Editorial note: We expect that the amount of oil actually spilled will be much greater than what TransCanada is claiming at the present time. The history of pipeline companies understating spills is well documented.